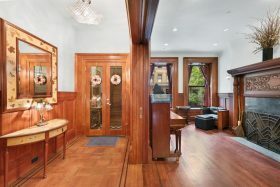 Designed by prolific Upper West Side architect Charles T. Mott in 1891 for Dow Jones founder Edward Jones, the facade of this five-story townhouse at 325 West 76th Street hints at the rich history and the grand details within. The current owners renovated this 20-foot-wide, 7,515-square-foot home in the 21st century, slowly and meticulously preserving historic details in the transformation back to single-family mansion. This turn-key historic house is on the market for $11.9 million, including six bedrooms, an elevator, a screening room, a top-of-the-line kitchen and several entertaining spaces.